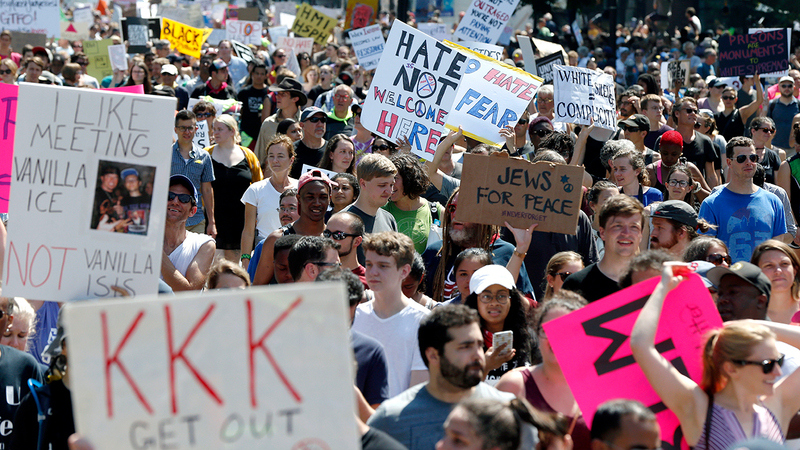 BOSTON -- Thousands of demonstrators chanting anti-Nazi slogans converged Saturday on downtown Boston, dwarfing a small group of conservatives who cut short their "free speech rally" in a boisterous repudiation of white nationalism a week after racially tinged bloodshed in Virginia. Police Commissioner William Evans said Friday that 500 officers - some in uniform, others undercover - were deployed to keep the two groups apart Saturday. Boston's Democratic mayor, Marty Walsh, and Massachusetts' Republican governor, Charlie Baker, both warned that extremist unrest wouldn't be tolerated in this city famed as the cradle of American liberty. Opponents feared that white nationalists might show up in Boston anyway, raising the specter of ugly confrontations in the first potentially large and racially charged gathering in a major U.S. city since Charlottesville. But only a few dozen conservatives turned out for the rally on historic Boston Common - in stark contrast to the estimated 15,000 counterprotesters - and the conservatives abruptly left early. Walsh greeted counterprotesters Saturday morning outside Reggie Lewis Center in the city's Roxbury neighborhood. Counterprotesters from Black Lives Matter and other groups denouncing racism and anti-Semitism marching from there to the Common, and another group plans to rally on the steps of the Statehouse overlooking the sprawling park. Some counterprotesters dressed entirely in black and wore bandannas over their faces. They chanted anti-Nazi and anti-fascism slogans, and waved signs that said: "Love your neighbor," ''Resist fascism" and "Hate never made U.S. great." Others carried a large banner that read: "SMASH WHITE SUPREMACY." Walsh said the city would do whatever is necessary to head off violence initiated by either side. "If anyone gets out of control - at all - it will be shut down," he said.